Lisa Moore returns with a new novel that makes good on the recent accolades bestowed upon her excellent 2010 novel, February. Her new book is titled Caught, and takes the plot device of a prisoner on the run as its starting point and introduces us to David Slaney, a would-be smuggler who escapes from jail on the eve of his 25th birthday. Slaney was four years into a sentence for spearheading one of the biggest pot-smuggling cases in Canadian history, but now that he’s out, he and his buddy Hearn plan to do it all over again, only not get caught this time. 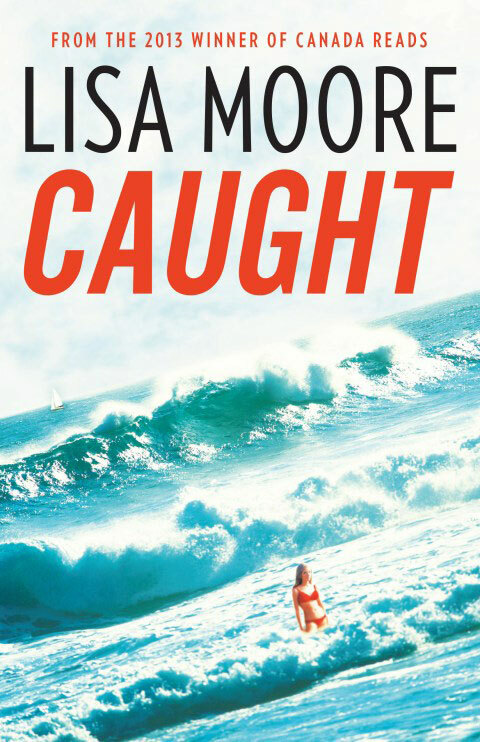 While Caught may come off as a summer thriller with its flashy dust jacket and fast-paced opening pages of an escaped convict in an orange jumpsuit racing through brush and brambles in darkness, this is still very much a languid and reflective Lisa Moore novel, full of empathy for its characters, rich attention to detail, and highly memorable scenes. Caught is set in the late seventies and is split into two narratives – the first focusing on escaped prisoner David Slaney, and the second on Patterson, an undercover cop whose career depends on catching Slaney and Hearn red-handed. At first Patterson seems stiff, a cop who sweats too much, and seems desperate for a promotion, yet Moore gently builds layer after layer of character around him, making him whole, fallible, and decent. The same goes for David Slaney, who Moore portrays as a bright-eyed kid – still full of optimism and love and adventure, qualities a second stint in prison will be sure to dash out. Slaney’s not a mean guy, or a delinquent, in fact he’s quite the opposite, Slaney only wants people to be happy and feel safe, and we see this countless times as he makes his way across the country from Nova Scotia to Vancouver to reunite with his buddy Hearn. Some of the strongest scenes come from Slaney’s chance encounters as he makes his way to the west coast. The ride from a girl who lives with her grandfather, the rescue of a drowning woman on the beach and a bride having her wedding dress zipped up in a hotel room are just a few scenes that immediately come to mind. They are filled with such fine imagery that they leave a lasting impression on the reader. But the novel’s most compelling passages arrive when Slaney is en route to Colombia on a boat with a drunk sailor named Cyril and his way-too-young summer fling, Ada. Moore handles these at-sea scenes with ease, making her readers feel the water lapping at the hull of the ship, and the sun and salt water burning their skin. Caught is an excellent novel. It begs to be read quickly, yet Moore’s language and imagery demands it be read slowly. Line by line it is probably the most finely crafted novel of Moore’s career and will no doubt be considered one of the best books of 2013. Her prose is veering into Hemingway territory, cutting to the heart of things so simply and frankly, and making us really feel what her characters are feeling. To give just one slight example as Slaney considers Ada while on the way to South America: “Slaney thought there was something true in her. He could not understand how she had come to be there with an old drunk. They were overtaken by stillness. The sea was still and there wasn’t a breath of wind.” Honest and propulsive, Caught is a mature novel from an author still proving she only gets better with time. This entry was posted on August 23, 2013 at 01:18 and is filed under Words. You can follow any responses to this entry through the RSS 2.0 feed. You can leave a response, or trackback from your own site.